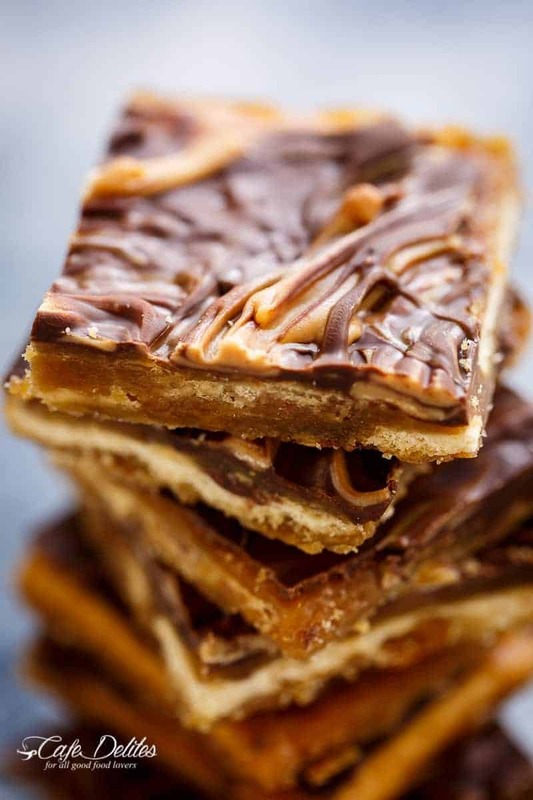 Christmas Crack or saltine cracker toffee with a peanut butter swirl is easy to make with only FIVE INGREDIENTS. Salty + sweet and ADDICTIVE homemade Christmas crack made with crackers, butter, brown sugar, chocolate chips and Reese’s. Perfect to give out as gifts along with our Best Fudgy Chocolate Crinkle Cookies and Rum Balls, or serve as a dessert with a Churro Christmas Tree! The EASIEST Christmas candy to make! A super addictive and popular christmas treat made with salty crackers and sweet toffee, and smothered in melted chocolate. Traditionally, it’s topped with chopped nuts or flaked almonds. Today, we are topping ours with a PEANUT BUTTER SWIRL. But… why is it called Christmas Crack? Well, I’m guessing it’s because of the whole addiction problem with this particular toffee, and the whole it should be a criminal offence to start with one. I mean, you just can’t stop eating them they are super addictive! Christmas crack tastes just like salted toffee mixed with a mouthwatering cracker base. Throw that in with creamy chocolate and salty peanut butter, and this would have to be the easiest Christmas treats recipe you could make in less than 15 minutes! Christmas crack is made up of layers. The first layer: arrange your Saltine crackers (Saladas) in a single layer on a lined baking sheet to create a base. You can also use Ritz crackers or graham crackers, or other plain, salty crackers you have on hand. The second layer: Toffee is drizzled all over the crackers and baked for a few minutes until nice and bubbling. The third layer: Throw on some chocolate chips, return to the oven for a further 2 minutes (or enough for the chocolate chips to melt), remove, then spread the melted chocolate over the top with a clean spatula or knife. The swirl: Top with Reese’s peanut butter chips, let sit for 2 minutes to melt, and use a fork to swirl the melted peanut butter chips through the chocolate. You can use toothpicks or a skewer. 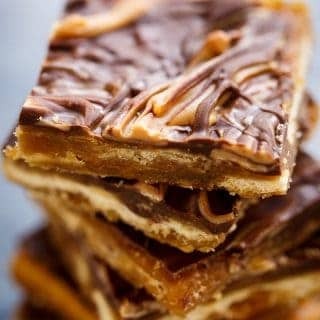 Refrigerate the saltine toffee until firm, then cut it up following the saltine breaks OR smash it up! Keep your eye on the toffee while boiling. Make sure you boil it for 3 minutes (set a timer if needed) so it doesn’t burn. 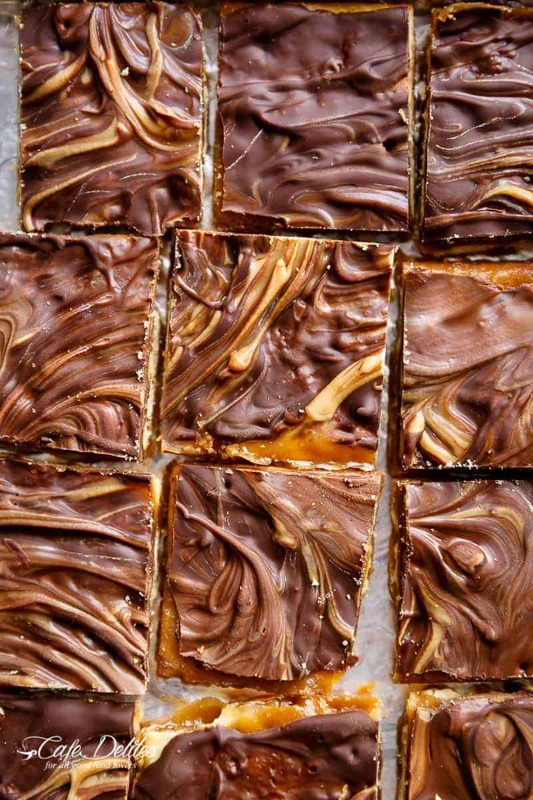 Use a heat-proof spatula to spread the toffee and chocolate layers. For the chocolate, we use a good quality semisweet chocolate. You can use milk or dark chocolate if you prefer. If you don’t like peanut butter, you can create a white swirl using white chocolate chips. Not a fan of a good swirl? How about topping the chocolate with chopped nuts, crushed candy canes, pretzels, M&M’s, sprinkles… the options are endless! Be prepared to give out the recipe. People will be asking you for it! Christmas crack stays fresh for up to a week in an airtight container. Store it in the refrigerator to prevent the chocolate from going soft or melting at room temperature, then break it up and serve. Need a larger batch? You can easily double the recipe and use two baking sheets. You may need to make a double (or triple) batch. Toffee saltine candy does NOT last! Looking for more Christmas treats? Try these! 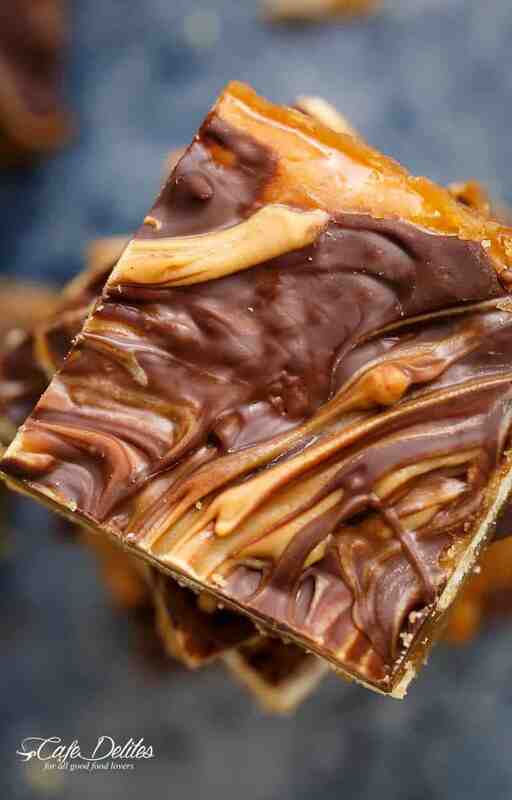 Christmas Crack or saltine cracker toffee with a peanut butter swirl is easy to make with only FIVE INGREDIENTS. Salty + sweet and ADDICTIVE homemade Christmas crack made with crackers, butter, brown sugar, chocolate chips and Reese's. The EASIEST Christmas candy to make! Preheat oven to 350°F (175°C). Line a large baking sheet with aluminium foil or parchment paper (baking paper). Spray with non-stick spray. Arrange crackers in a single layer in rows on the tray. (You may need to break some crackers in half to fit the last column.) Set aside. In a medium-sized saucepan, melt the butter on low heat. Add the brown sugar and increase heat to medium. Bring the toffee to a boil while continuously stirring, then allow to boil for 3 minutes until it turns caramel in colour (set a timer if you need too). Pour the toffee over the crackers. Working quickly, spread the toffee evenly over the crackers with a spatula. Bake in hot oven for 4-5 minutes or until beginning to bubble. Remove from the oven and top with chocolate chips. Return to the oven for a further 2 minutes (for the chocolate chips to melt), remove, then spread the melted chocolate over the top with a clean spatula or knife. Add the peanut butter chips on the chocolate, let sit for 2 minutes to melt, and using the end of a fork, swirl the melted peanut butter chips through the chocolate. Cover with foil and refrigerate until set or freeze for 15 minutes until chilled. Peel the foil off of the back of the crackers; break up into pieces and serve or store in an airtight container. HI Judy! That’s a great question! You can try them. I’m sure that they will melt though? If they don’t melt, you can always crush them and sprinkle them over the top. YUM! Cat! I hope I’m not too late! Can you return the tray back into the warmed oven for 5 minutes (the oven turned off) for 5 minutes. They need warmth. I’ve made toffee many times but with salted butter. Why the unsalted butter in this recipe? Hi Michele, I use an 11×17-inch baking sheet! Do not use mini chocolate chips! I ruined the whole batch with them! They don’t melt the same as the regular ones and get gritty when spread! I’ve made a similar recipe before with good results. Not the recipes fault. That’s just all I had at the time. Hello! Is there any thing else you can use in place of toffee? Thanks for the feedback. I am so happy you enjoy them!! Do you continue to stir the toffee during the 3-minute boiling period? Are peanut butter chips available in Australia? I’ve never seen them here. Yes! They are in the baking isle. Sometimes it is hard not to eat the whole bag ;)! Okay, so I made this the other night and can I just say WOW. This is properly called “crack” because I had ONE PIECE when I got hot from work last night and that turned into dinner. This is a dangerous recipe that I will be repeating (when I have unsuspecting people to share the portions with)!